Have you ever wondered where broken hearts really go? Well if you ask the renowned love doctor, Dr. Ino Balagtas, these broken hearts did actually find their way home -- in Panacea! For almost four decades, Panacea have been healing different disabilities caused by love problems all over the country. 1. Emotionally impaired - Unable to hear what your other half says; or are you just too dismissive to listen to them? 2. Emotionally decapitated - The ones who can't walk or even stand on their own two legs; the ones who depend too much on their partners. Other emotional disabilities include visual impairment caused by too much love, becoming a hunchback due to excessive affection, and being too foolish to know that you're in an unhealthy relationship. To celebrate its 35th year, Artistang Artlets proudly presents, “PANACEA” a piece adapted from Danielle Joyce Factora’s “PWD: Puso with Disabilities." This production is headed by the guild’s beloved alumni. Original “Miss Saigon” cast member and acclaimed TV actress, Ms. Isay Alvarez Seña, Aj Carag, Kris Andres, Xi Ramos, Jey Amurao, John Emmanoel Moran, Roi Paolo Calilong, Mates Salviejo, Jonathan Montes, Nicole Manlulo, Andrea Padilla, Josh Sef Balburias, and Steve Michael Moore. Directed by Gene Maninang and produced by Therese Gracielle de Guzman and Karla Angela Tajon, PANACEA is set to run on December 3, 4 and 5, 2015 with time slots at 3pm and 8pm at the Girl Scout of the Philippines Auditorium, 901, Padre Faura St. Ermita Manila. Ticket price is at P500. 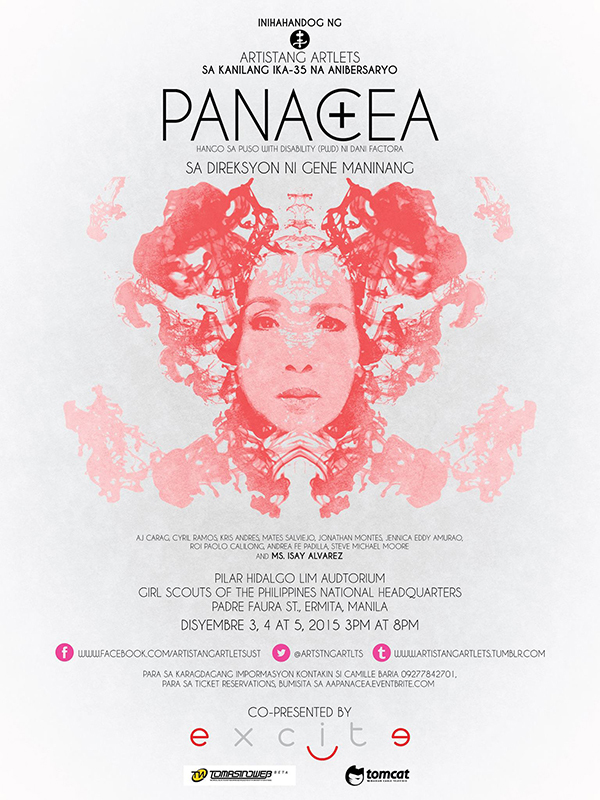 For more information on PANACEA, you may contact Artistang Artlets at 0916 525 3357.